The Milk Booth at the State 4 H Fair at Charleston, W. Va. Location: Charleston, West Virginia, 1921. Photo by Lewis Hine. National Child Labor Committee Collection, Library of Congress, LC-DIG-nclc-04435. This is the first (and hopefully not the last) special guest post to the blog. Here, classicist and art historian Dr. Kate Topper explores the way drinking cultures can act as forms of identity politics in both antiquity and now. These cultures normally act to create an 'in' group -- a norm-- against which others are defined and excluded. Here she compares recent 'milk chugging' parties by some white supremacist groups to the ancient symposium. 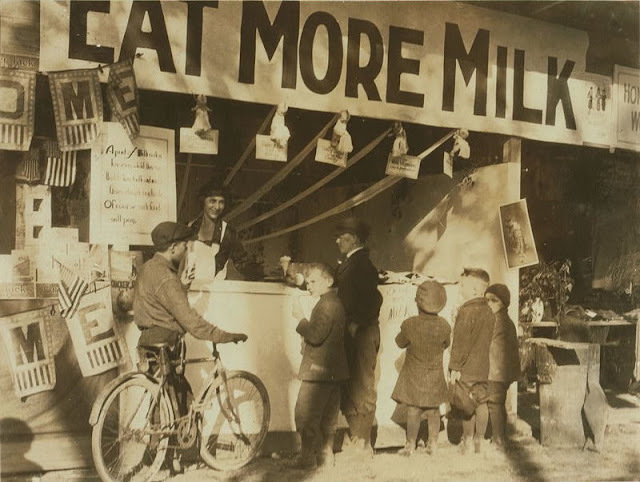 For additional readings on the history of the American eugenics movement and how milk fits into it, I recommend Volume 29 of the Public Historian, particularly the article on the Fitter Families programs at local, state, and national fairs. As readers of this blog know, white supremacist groups are in the news with alarming regularity these days, and earlier this month they made headlines for a reason that – to judge from my social media feeds – struck a lot of people as really strange. Relying on a widely held but not quite accurate belief that only white Europeans are genetically capable of digesting lactose as adults, some of the more exhibitionist members of American white supremacist groups have taken to chugging milk as a way of demonstrating the “purity” of their European descent. Following moral disgust and nausea, the most common reaction I’ve seen to this stunt is bafflement, both at its logic and at the fact that it would even occur to someone to chug milk to prove their racial superiority. Yet for someone who studies the history of a different type of drinking – ancient Greek wine-drinking, in my case – it feels depressingly familiar, and I believe that looking at white supremacist milk-drinking in light of one of its historical precedents can help to expose the emptiness of its claims in a way that scientific debunking alone can’t. 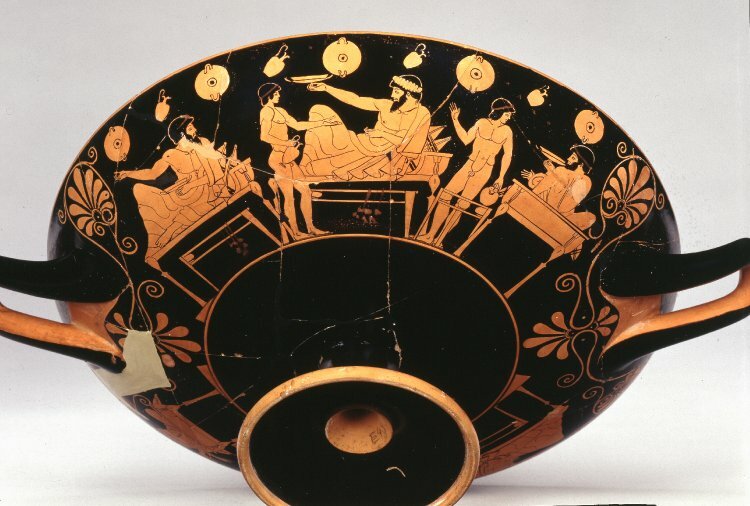 The focus of my research (and much of my teaching) is the symposium, a nocturnal wine-drinking party for ancient Greek men. One point I take pains to emphasize when I introduce the symposium to students is that the ability to drink wine “correctly” was considered a proxy for the ability to participate responsibly in civic life. The symposium was all about defining community – determining who got to be part of it, and who had to remain on the margins – and the people who were excluded from the rights and protections of citizenship (such as women and foreigners) were, not accidentally, the same ones who were most commonly lampooned as incompetent drinkers of wine. Competent sympotic drinking meant drinking your wine communally and at the same pace as your companions. An early fifth-century cup shows a group of men arranged comfortably around the room, each supplied with a large cup. 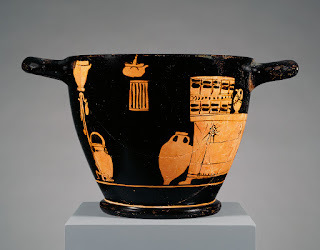 The wine should also be mixed with water; there was a special bowl for this purpose, called a krater, and as early as the eighth century BCE, we find oversized kraters used as grave markers. Funerary kraters sent a clear message about the deceased’s social identity – he drank his wine communally and mixed with water, so he was a civilized Greek man. Woman drinking wine from storeroom. 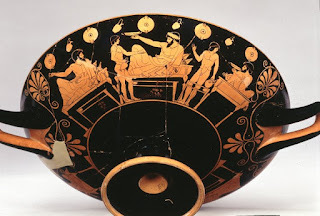 Athenian red-figure cup, ca. 460-450 BCE. Malibu, The J. Paul Getty Museum 86.AE.265. Side a.
Malibu, The J. Paul Getty Museum 86.AE.265. Side b. Women and foreigners, by contrast, were both seen and represented as incompetent drinkers. 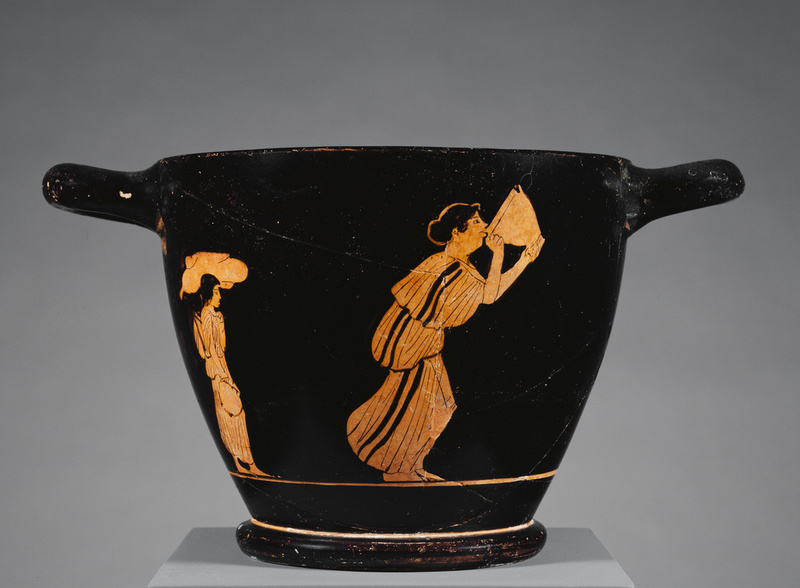 On a cup from mid fifth century Athens, a woman gulps her wine down alone, having pilfered it from the storeroom depicted on the other side of the cup. Her body language suggests that she’s trying to drink it hastily and furtively, and the wineskin carried by her small attendant suggests that she hasn’t bothered to mix it with water. We’re probably meant to laugh at the woman’s excesses – not to mention her dubious housekeeping abilities – but the scene also contains a serious warning about women's unsuitedness for serious responsibility. Sleeping symposiast in Asian dress. 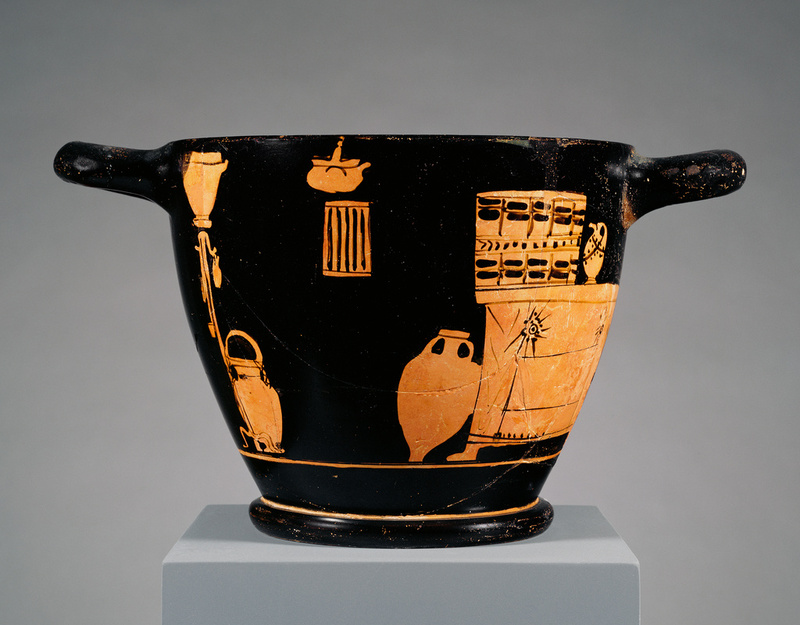 Athenian red-figure cup by the Chaire Painter, 5th c. BCE. Basel, Antikenmuseum und Sammlung Ludwig BS 1423. The story was much the same for non-Greek people – who, according to a common stereotype, drank their wine unmixed. On the interior of another cup, we find a sleeping symposiast whose clothing identifies him as being from western or central Eurasia. His sympotic behavior is a collection of stereotypes about foreigners – he has passed out drunk after imbibing from the drinking horn that rests below his couch. The horn was a shape the Greeks associated with foreigners and primitives and with the drinking of unmixed wine, and it was also one that couldn't easily be put down and that thus encouraged fast, intemperate drinking. This man would be an embarrassment at the symposium – but what else, it is implied, could an Athenian expect from a barbarian, who was not culturally or physically suited to drink wine properly? Like the woman on the Getty cup, this guy was not the type to be trusted with serious matters of governance. To come back to the white supremacist milk-chugging stunt: I’ve spent enough time looking at pictures like the ones described above not to be shocked or even surprised by this twenty-first century trend, even if I’m physically and morally disgusted by it. One thing you quickly learn when you study the history of food and drink is that eating and drinking are intimately tied to the performance of identity. For a Greek man, socially competent wine-drinking was a way to perform a specific gendered and cultural identity – if he didn’t know to mix his wine with water, or if he insisted on filling up on wine while the rest of the group drank slowly, his companions would have some questions. For a segment of American white supremacists, identity performance takes the form of milk-chugging. And it’s very clearly a performance: in the video shared by the New York Times, a group of bare-chested men stands together, exaggeratedly flexing their muscles before attempting to pound down a half gallon of milk. Others (both men and women) take the “challenge” at home and post the video evidence to YouTube or Twitter for their followers to watch. It’s important to them that people watch, just as it was important for a Greek symposiast to be observed by his companions, because these rituals are ultimately about establishing or maintaining membership in a group to which not everyone is allowed to belong. For me, this juxtaposition of ancient sympotic drinking and modern milk-chugging is useful because it exposes the recent white supremacist trend as nothing more than a performance – the latest version of a trick human beings have long used to reinforce the legitimacy of the existing in-group and pretend that there’s an objective basis for excluding the out-group. The scientific gloss given to the milk-chugging challenge doesn’t make its claims uniquely valid or worthy of serious consideration, and not only because, as geneticists point out, those claims distort the science. Even without the white supremacists’ (erroneous) claims about genetics, milk comes with a lot of cultural and symbolic baggage that I have to think contributed to the choice to use it as the centerpiece of this racist performance. Like wine did for the Greeks, milk has long occupied a special status in discourses about who is and is not civilized (although whether it was a drink of civilized or uncivilized people has always depended on whom you asked). And in the United States it has been closely tied to ideals of purity since the middle of the twentieth century, even when those ideals are at odds with biological facts. Milk, in other words, is no less culturally charged for twenty-first century Americans than wine was for the ancient Greeks. As much as the white supremacist milk-chuggers want us to think that their stunt is based in biological fact, it’s really all about cultural perception – to paraphrase the cliché, it’s old wine in a new bottle, only this time the wine is milk. White supremacist groups may have chosen a different beverage to make their point, but their logic is as faulty as that of the ancient Greek man who believed that his habit of drinking wine in the culturally prescribed way made him superior to women and foreigners. We should take their claims no more seriously than we now take the ancient Greek ones.